Bengaluru: In a flat, grazing plain near the Kollur area in Karnataka’s Udupi district, a team headed by an Indian researcher discovered stone carvings that could date to 10,000 BCE. 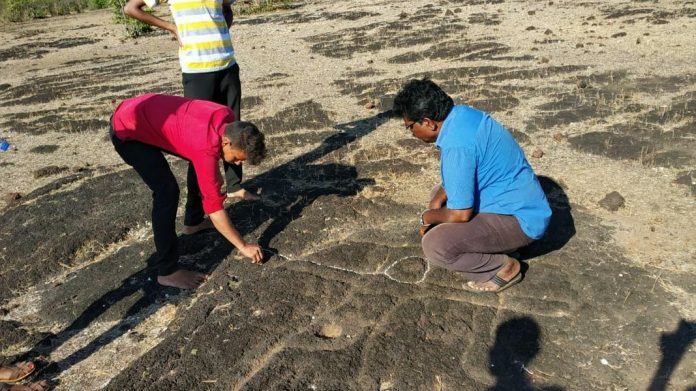 The petroglyphs — giant images carved on rock by chipping away parts of it — were discovered on 17 February by Murugeshi Turuvekere, associate professor, Department of Ancient History and Archaeology, MSRS College Shirva, Udupi. The finds follow another discovery of Tulu inscription dating back to 1159 CE by Turuvekere announced earlier this week. The rocks that were carved were found in a plain about 20 acres in size, called Avalakki Pare, in Udupi. Nineteen different engravings were found and all the petroglyphs seem to depict a hunting scene. Ten of these were humans, including the depiction of a female figure that had a cup mark on her stomach and another on her head. Turuvekere believes she was probably a religious figure, given her cup marks. There was also a baby engraved on the rocks, along with eight other humans. The other nine figures are those of animals being hunted: Several deer, bulls, boars and birds. “We found 19 on our initial trip, I’m sure there would be more there,” Turuvekere told ThePrint. His team also discovered remnants of Stone Age tools — arrow heads, blades, stone slings, scrapers and other sharp points that were used as weapons. No agricultural tools were found, indicating that the community that made the petroglyphs were still hunter-gatherers. The tools were made of dolerite, a type of dark igneous rock found in small intrusive bodies like dikes, which form in the gaps between rocks, and sills, which forms between layers of sedimentary rock. While the exact age of the rock hasn’t been determined, experts believe the rock could date anywhere between 10000 BCE and 3000 BCE, falling right into the middle part of the Stone Age period in India. “I think we can reasonably place the tools between 7000 and 6000 BCE,” said Turuvekere. Early Stone Age, also known as paleolithic age, began at different parts at different times: In Africa, stone age was 2.5 million years ago. In China, around 1.7 million years ago. But as the ice-covered earth slowly warmed up, civilisations slowly transitioned into the mesolithic period of history, the middle stone age. In India, mesolithic age began at about 12000 BCE and lasted until 2000 BCE. In Europe, it began in 8000 BCE. 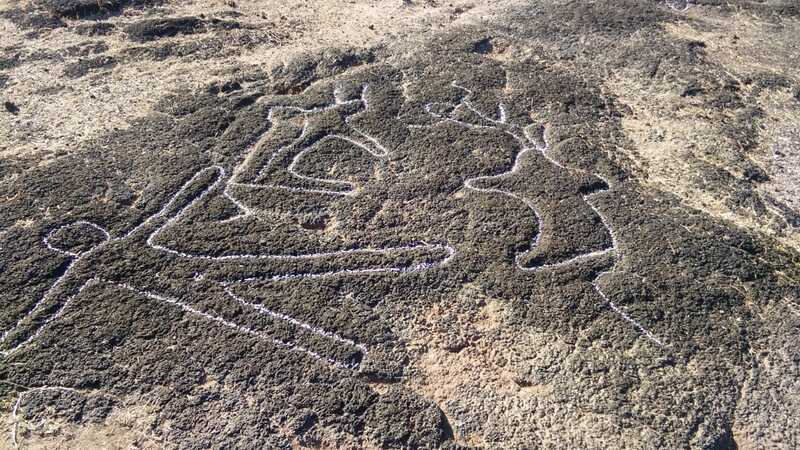 This is the first time petroglyphs of this age have been found on the west coast of India. Previously, petroglyphs have been found in Madhya Pradesh, Karnataka, Maharashtra, and Tamil Nadu. 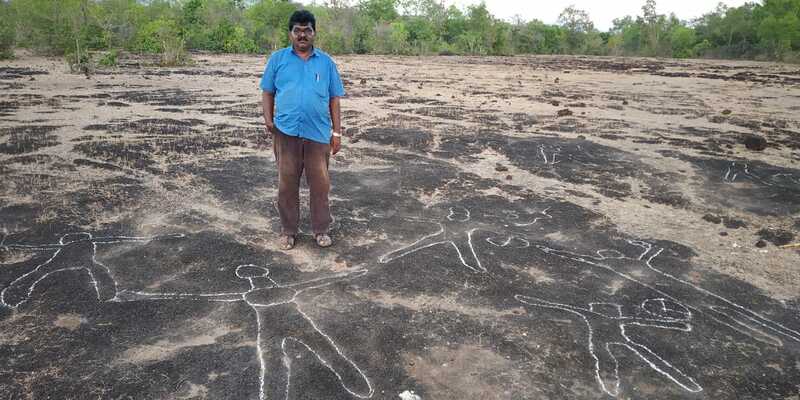 Turuvekere himself unearthed petroglyphs previously in Karnataka and reached out to the locals explaining the findings. This time, it was local villagers who spotted these new petroglyphs and reached out to him. The female religious figure is of importance, according to Turuvekere. “Avalakki Pare is famous for its female worship and the Kollur Mookambika temple has drawn crowds for centuries. The primary implication of this finding is that the worship of female figures such as Mookmabika Devi could actually date back to the mesolithic age in this region,” he said. 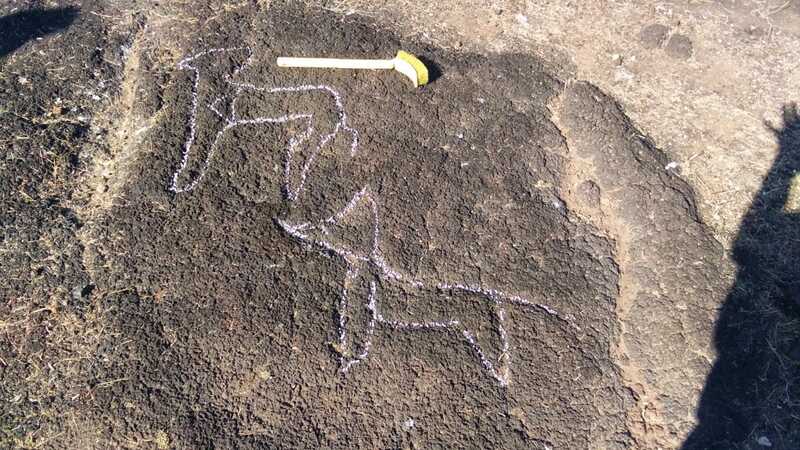 Previous petroglyphs from this time period found in Maharashtra threw up a couple of mysteries. The hunter-gatherer community had carved out scenes depicting hunting of animals that were not endemic to the region they were settled in, including hippos and rhinos, said an earlier BBC report. Around the time that these petroglyphs were carved, several settlements in India were already transitioning into the neolithic age. The Indus Valley Civilisation was just taking root on one side, while rice was being domesticated on the other. Animals were already domesticated and early religion was taking shape, but writing was not yet invented. The stone age came to an end with the advent of metalworking, between 3500 BCE and 2500 BCE, as civilisations transitioned into the bronze age. Also read: TalkPoint: Do the excavations of ancient stone tools in India reshape our theories of early human migration?